Trafalgar had to work hard for a 2-1 win at Fylingdales to remain top of Scarborough News Sunday League Division One, while Newlands and Cayton both lost out in the NRCFA Sunday Challenge Cup. The league leaders had to draft in three second-teamers and sign up two new players at the last moment to raise a side at Fylingdales. Danny White opened the scoring from the penalty spot five minutes from half-time after Wayne Aziz had been fouled in the area. The hosts battled back to level the scores with Mikey Kilpatrick’s composed finish, as he turned inside defender and dinked his shot over the keeper after great through-ball from Jake Faichney. Aziz’s wonder goal 15 minutes from time secured all three points for Traf, the former Pickering Town ace racing free of the Dales defence before curling a superb shot into the top corner. Heslerton consolidated second spot with a 2-1 win at home to Barrowcliff. Josh Bown made it 1-0 at half-time and although the visitors did level after the break debutant James Tadman fired in the winner 10 minutes from time for the villagers. Mikey Clark was named as the man of the match for Heslerton. Division Two leaders FILO were pegged back to a shock 2-2 draw at Crown Tavern. The visitors, who were already without several players due to injury, played the first 15 minutes with only nine men due to a car breaking down on the way to Scarborough , but they still managed to go ahead through a Phil Raisbeck penalty. 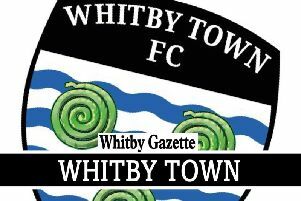 Paul Tose made it 2-0 five minutes before half-time, and with only 10 minutes remaining it looked like Les Brown’s depleted side would return to Whitby with all three points. Tavern had other ideas as Ryan Jones fired in a shot from an acute angle after his own corner had been cleared in the 80th minute, and shortly after Leroy Donaldson smacked in the leveller after an effort rebounded to him. Centre-back Kyle Ireland was Tavern man of the match, while Brown hailed the efforts of his entire makeshift team. Trafalgar Reserves pulled to within a point of FILO after roaring to a 15-0 success at home to nine-man Alma. Luke Jones banged in five goals, while Sam Pickard hit a hat-trick, and Curtis Rose and player-boss Mikey Barker struck a brace apiece. Chris Cass, Dane Ramos and Martyn Ferrey also notched for the home side. An understrength Newlands Park suffered a 5-3 loss at Park End in the NRCFA Sunday Challenge Cup second round, an early exit for last season’s runners-up. The hosts roared into a 3-0 lead before Stew Bates pulled a goal back from the penalty spot. When Jack Hakings headed in their second Newlands must have felt they had a chance of coming back, but Park End went 4-2 up only for a Jack Ramos header to set up a tense finale. The hosts scored a fifth to secure the win, with keeper Callum Myers shining for Newlands Park. Cayton suffered a 6-1 loss at Knayton in Thirsk, with Simon Stubbs’ late header a mere consolation. Roscoes Bar moved into the second round of the Goal Sports Trophy with a 2-1 home win against Barrowcliff Reserves. Graeme Farrah put the hosts ahead after 25 minutes, bringing the ball down in the box from a pinpoint Tom Allen cross and slotting it into the bottom corner. Ten minutes from time a poor Bar clearance allowed Lee Stewart the chance to level and he finished well. The home side then made a couple of changes with late arrivals Carl Hepples and George Allen coming on, and it was the former who played a superb through-ball to Farrah to finish low into the corner, although Barrowcliff claimed there were several Bar players offside. Player-boss Lee Paterson was named as the man of the match for the victors, while Barrowcliff joint-boss Tony Walker praised his entire team for their efforts throughout. Ayton hung on for a thrilling 5-4 win at Scarborough Campus. Niall Prentice put Ayton ahead after 15 minutes, but George Thompson levelled from the penalty spot. Ben Mason’s deflected speculative shot from 45 yards and an exquisite 20-yard lob from Dan Pollard put the away side 3-1 up at the break. Sub Joe Mills scored a cracking goal with the outside of his right foot to make it 4-1 after the interval and Pollard’s second sealed the win, only for the students to finish with a flourish. Thompson’s second spot-kick, followed by a long-range strike from George Friend and a late header from Sam Gowland. Ed Burrows was named man of the match for the hosts, with centre-back David Mitchell the star man for Ayton.